Meditating on contemporary iconography and language that supports the dismemberment of the human body, Mirror Stage uses a series of actions that create a fragmented experience of both the artist’s body and the collective body (the audience). 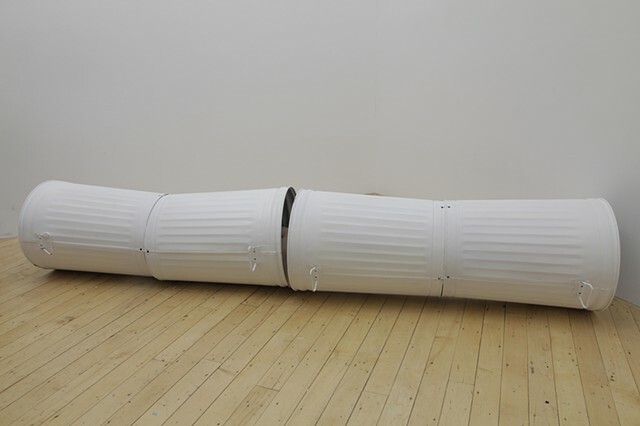 Installed in a fallen Doric-style column, constructed from trashcans, the artists’ body is only be seen through a sliver in the center of the column. 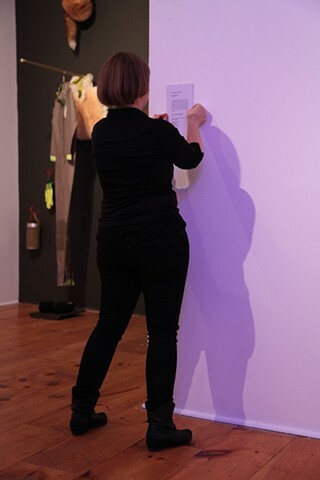 The artist reads excerpts from contemporary art theory texts around the body in art and the relationship between live art and the document. Inside the column, the artist uses video sharing technologies to create an alternative and expanded experience of the work to be witnessed through a variety of digital interfaces. The real-time audience is invited to follow a feed of fragmented videos that the artist produces from the inside of the sculpture. However the audience chooses to engage with the work, they will never be able to experience the piece in its entirety. Even for the real-time viewer that follows the feed, the moments of looking into their mobile device will compromise their presence with the piece unfolding in real time. Mirror Stage addresses tensions around the act of witnessing, unique to the 21st century.